2019 marks our 13th year of business, and we have sold thousands of vehicles and counting, which includes multiple vehicles to the same families and repeat customers! Our owner, Dana Furthmiller, has over 30 years of auto sales and management experience, and our strategy is simple; provide great cars at a great price under $10,000, with no high-margin markups or high-pressure sales tactics. We do not overprice our cars, and we are proud to post all of our prices clearly on each vehicle. Our internet pricing is also the same prices that we display on our vehicles at our lot, so NO worries about getting a GREAT deal, or missing out on a better price. We will always answer any questions or concerns with an honest, straightforward approach, so you can trust our information will be accurate when asked. We know that if you like what we have to offer, and the price is always more than fair, you will buy from us. Feel free to email our Owner - Dana Furthmiller (dana@furthmiller.com), our Store Manager - Jay Fitzgerald (jay@furthmiller.com), or our Office Manager - Colissa Fisher (colissa@furthmiller.com) for more information. Or CALL OR TEXT 260-357-4300 day or night! Over 80% of our vehicles are sold via the Internet to customers just like you, so be confident that our vehicle descriptions are accurate! Browse our website and check out hundreds of our customer pictures and their vehicles! We hope to see you SOON in Auburn! 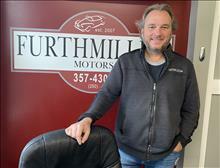 Dana Furthmiller has been around cars all of his life. His father, Dave Furthmiller, owned and operated Dave Furthmiller Speed Shop in Fort Wayne, Indiana, during the 60's and 70's, specializing in high peformance racing engines, and was known for delivering "Power not Promises" to many racers and car enthusiasts. Dana's automotive career also started in his hometown of Fort Wayne, Indiana, in 1982, where he worked in the service department for a local Harley-Davidson dealership during high school. In the Spring of 1986, Dana moved from motorcycles to cars and accepted a service manager position for a Toyota store in Fort Wayne. Over the next 7 years, Dana advanced through the service department ranks where he eventually became the Parts and Service Director in charge of several franchises for an Indiana-based mega-dealer. During this time, Dana served 4 years in the Indiana Air National Guard. Then in 1993, a promotion into Sales Management for this same mega-dealer led Dana to a 14 year career climb to running multiple new car stores with positions as a Sales Manager, General Sales Manager, Director of Operations, and General Manager. Finally, the timing was right for Dana to step out and fulfill his dream of opening his own business. Furthmiller Motors was opened in February of 2007 in Auburn, Indiana. With over 30 years of service and sales experience, Dana is knowledgeable and understanding as to what it takes to deliver on promises and exceed the expectations of customers. 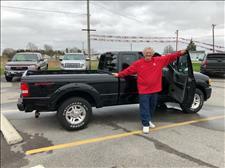 Dana strives to run his own dealership with a relaxed, laid-back approach, answering all questions and concerns with the utmost professionalism and honesty. Dana plays bass guitar on weekends, and enjoys listening to and performing live music. He has been married for over 26 years to Katie, and has three daughters, Erica, Alexis, and Natalie. 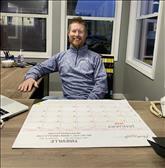 Jay Fitzgerald joined Furthmiller Motors as the Store Manager in August of 2016, after spending a few years at another local independent auto dealer as a sales associate. Jay is not new to the car business though, because in 2001 he opened and operated his own business for 10 years called ProMotion, which serviced several local car dealers with promotional products, including signage, banners, streamers, flag poles, you name it! Around this time in 2002, Dana Furthmiller and Jay met. In fact, Jay designed and produced the first signage for Furthmiller Motors back in 2007, which we still proudly display today inside our sales office. Jay has been with his wife Karyn for over 20 years, and they have 2 beautiful children, Jack and Rissa. Jay is a proud graduate of Northside High School in Fort Wayne, and has been a lifelong, local guy. When Jay is not working, he likes to root for the Pittsburgh Steelers, and hit every Jimmy Buffet concert that he can. Colissa Fisher joined our Furthmiller family in April of 2016 as our Office Manager. She is always happy to walk our customers through the paperwork portion of purchasing a vehicle, answering any questions they may have, & is in charge of all things titlework. Her favorite part of the job, though, is managing our social media accounts, where she really gets to express her creativity, come up with fresh ideas for advertising & shoot really fun videos with the gang! (Check those out here!) 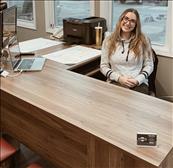 Essentially, she sets a warm and caring environment for customers as they arrive, and works hard to keep us organized and efficient throughout the day, which helps us to deliver the best customer service possible. When not at Furthmiller Motors, Colissa is usually spending quality time with her family: her partner, Christian; their cat, Maggie; & their new puppy, Murphy! She also loves being an auntie, doing yoga & being outdoors as much as possible. Carson Ohning joined Furthmiller Motors in May of 2017 as a high school senior, took a little time off to explore his options & has now returned to lend a hand in our detailing department! He helps us to keep the flow of new arrivals clean and ready to be represented on the internet. Carson is a proud graduate of Dekalb High School and has lived in Auburn his whole life. He is currently a freshman at Purdue Fort Wayne pursuing a degree in business marketing. When he's not working or at school, you can find him hanging out with friends either listening to music or going on road trips. He is super social & likes meeting new people, so never hesitate to say hi! 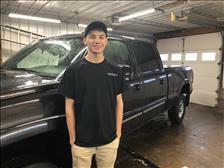 Lukus Childers joined Furthmiller Motors in September of 2018, and is a senior at East Noble High School, where he enjoys practicing his welding skills. Lukus is a big help in our reconditioning process, and helps us to keep the flow of new arrivals clean and ready to be represented on the internet. When he's not working, you might find him hanging out with his friends, playing video games, at a local car show, or in Kentucky riding four wheelers. He has a 2008 Mustang GT & a 1969 Nova that he enjoys detailing, working on, and presenting at car shows! If you wanna chat about all things car, he's your man, he loves meeting new people! We are super excited to have him as the newest member of our team.